Posted on November 24, 2014 by No Map Required Posted in Costa Rica, Places	. This was a layover between buses. Aaron and I are VERY proud of ourselves. The week we got here to CR, our hostel manager told us that if we wanted to see critters and do world-class snorkeling, we had come to the wrong beach. 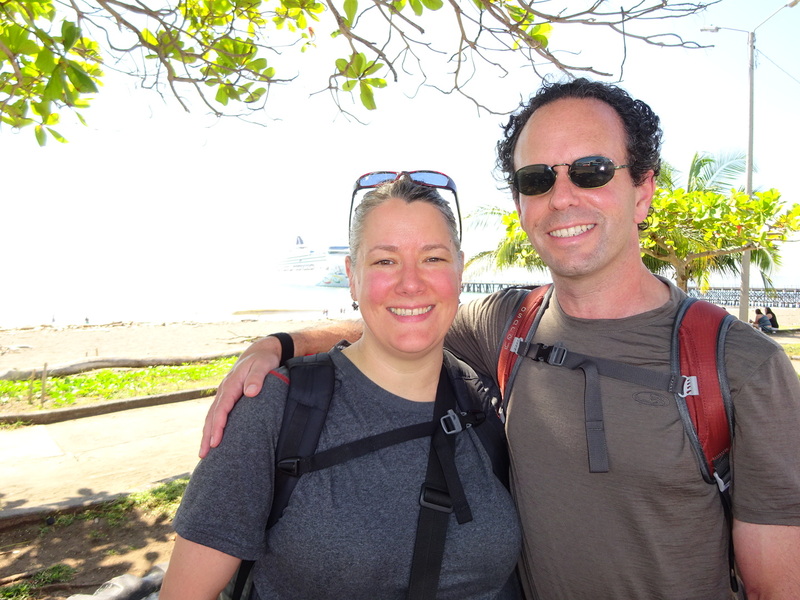 Better to get ourselves to the southern-most part of Costa Rica — Bahia Drake or Drake Bay. Pretty off the beaten path, typically tourists fly little planes into this area, or rent a car. Too rich for the likes of us! 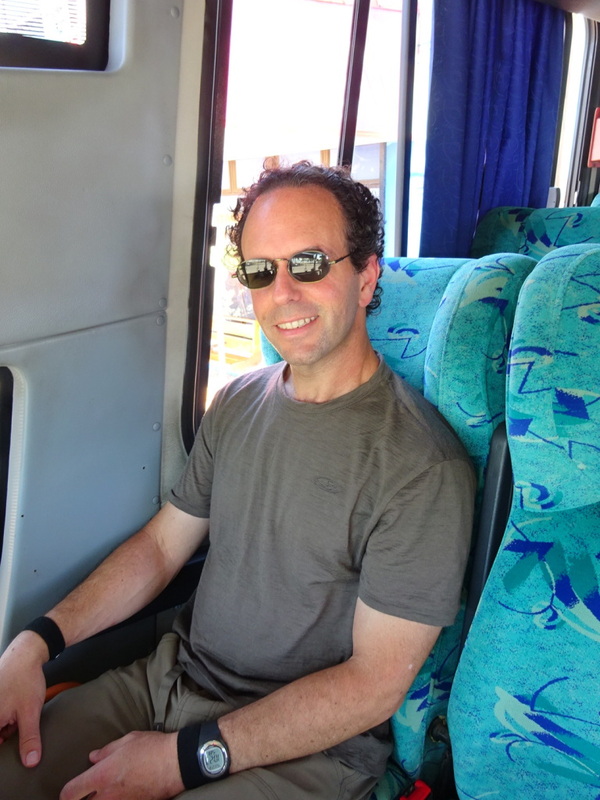 Aaron on one of the deluxe buses. They weren’t all this fancy. This is Edith. Her and her family own a little local hotel. We loved her hospitality! 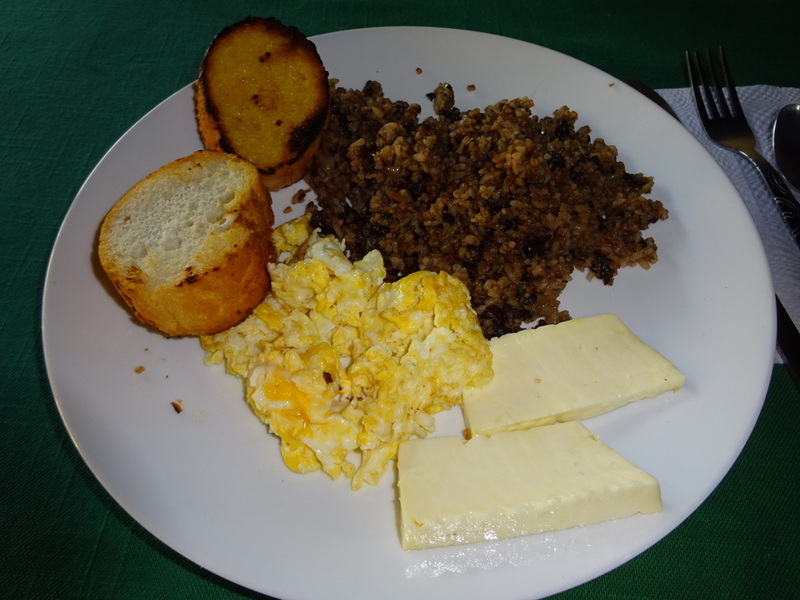 This is a typical Costa Rican breakfast: rice & beans, scrambled eggs, toast, and cheese or meat – like chicken. 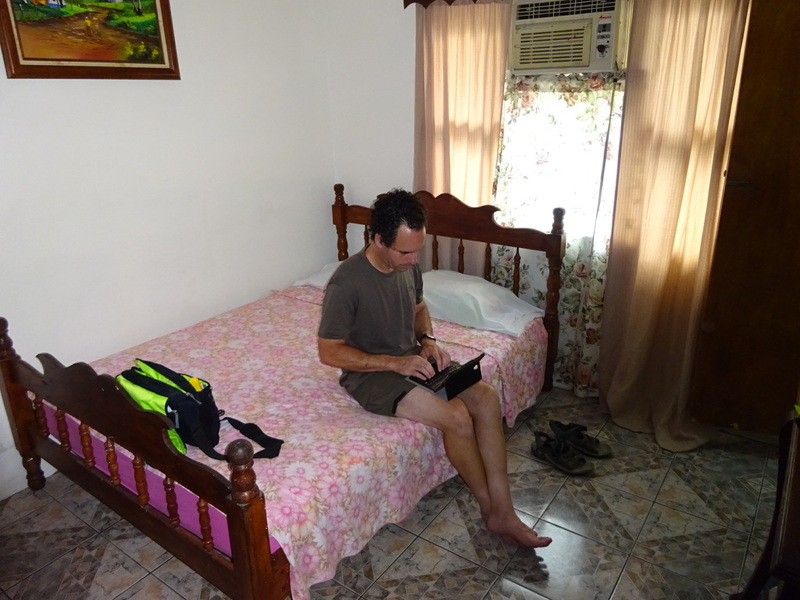 This is the room we rented from Edith. Aaron is sitting in the air conditioning. Ahhhh…. 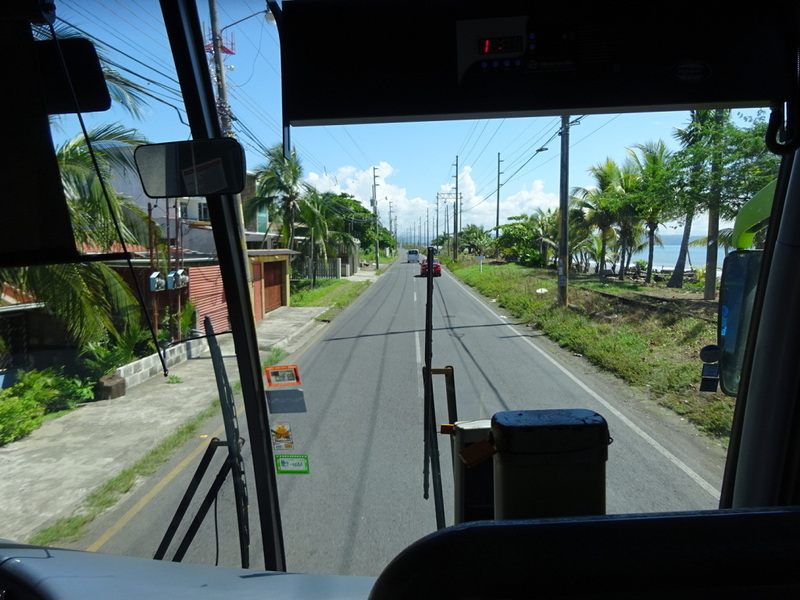 Today we took three – count ’em THREE buses, including a retired blue bird school bus that dropped us a block from our budget-ish hotel here in Sierpe after almost 7 hours on the road. With each bus, and as we moved further away from the capitol, fewer and fewer gringos were on the bus. Tonight, on the school bus, in the dark, we were the only tourists at all! 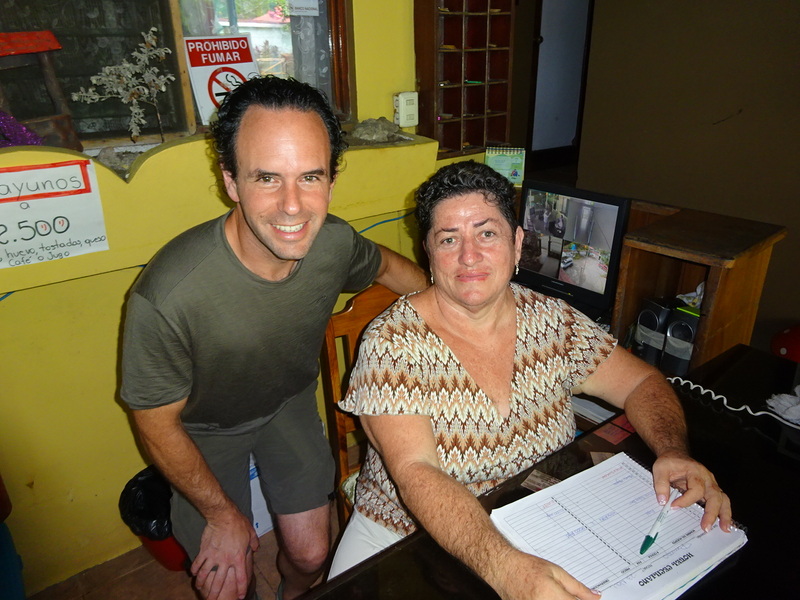 Locals told us when to get off of the bus and helped us find our hotel. It was awesome! If we would have taken a flight, we would have never met Edith or seen all these little towns and the change in terrain as we left the mountains and headed to the sea. Our view from the front seat. This is out of Putanares – the ocean is on the right. 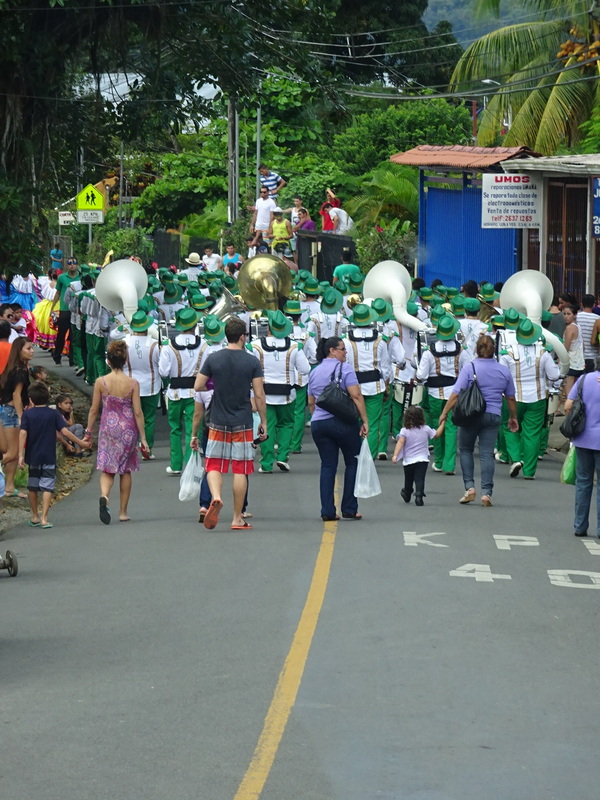 The bus turned down a little road and there was a parade in full swing! We had to back up and take a different way. Tomorrow we hope to solidify plans for Drake including taking a boat to get us there! Hopefully in the next day or two we will be snorkeling. Been snorkeling off a couple of the southern CR islands (not the rich ones you described). It was wonderful. Enjoy! We were totally rained out yesterday (epic storm! ), but planning to snorkel tomorrow morning. There’ll certainly be a post if it’s at all worthy! You guys look so relaxed – and what an adventure. But why is Aaron pooping in that lady’s trash can? You both looked so relaxed…no tension/stress in your faces!!! Love it! I’m really, REALLY trying to appreciate how relaxed you both look but am really, REALLY bummed that some of that “feeling” is due to the fact you fed wild monkeys. As the founder of the the Please-Don’t-Feed-Wild-Costa-Rican-Monkey Foundation, I’m going to have to ask the two of you to leave the country immediately and surrender all remaining bananas to the nearest comisaria de policia. I must go. There is a raccoon family at a house in Shoreline that I need to feed. Lucky for you we have already left the country. You will now find us in Panama with a new load of bananas.